You can use keyboards to enter some languages in different ways. A few examples are Chinese Cangjie and Wubihua, Japanese Kana, and Facemarks. You can also use your finger or a stylus to write Chinese characters on the screen. Build Chinese characters from the component Cangjie keys. As you type, suggested characters appear. Tap a character to choose it, or continue typing up to five components to see more options. Build Chinese Wubihua (stroke) characters. Use the keypad to build Chinese characters using up to five strokes, in the correct writing sequence: horizontal, vertical, left falling, right falling, and hook. For example, the Chinese character 圈 (circle) should begin with the vertical stroke 丨. As you type, suggested Chinese characters appear (the most commonly used characters appear first). Tap a character to choose it. If you’re not sure of the correct stroke, enter an asterisk (*). To see more character options, type another stroke, or scroll through the character list. Tap the match key (匹配) to show only characters that match exactly what you typed. Write Chinese characters. 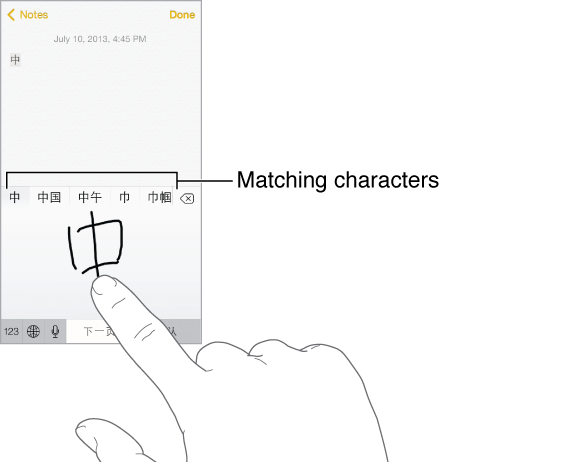 Write Chinese characters directly on the screen with your finger when Simplified or Traditional Chinese handwriting input is turned on. As you write character strokes, iPhone recognizes them and shows matching characters in a list, with the closest match at the top. When you choose a character, its likely follow-on characters appear in the list as additional choices. You can type some complex characters, such as 鱲 (part of the name for the Hong Kong International Airport), by writing two or more component characters in sequence. Tap the character to replace the characters you typed. Roman characters are also recognized. Type Japanese kana. Use the Kana keypad to select syllables. For more syllable options, drag the list to the left or tap the arrow key. Type Japanese romaji. Use the Romaji keyboard to type syllables. Alternative choices appear along the top of the keyboard; tap one to type it. For more syllable options, tap the arrow key and select another syllable or word from the window. Use the Japanese Romaji keyboard (QWERTY-Japanese layout): Tap , then tap the key. Use the Chinese (Simplified or Traditional) Pinyin or (Traditional) Zhuyin keyboard: Tap , then tap the key.